1. Who will pay to maintain and plow our roads? Building roads is expensive, but regular resurfacing, filling potholes and clearing snow is not factored into the building cost. The municipality must pay work crews for maintenance, and buy expensive equipment and huge mounds of salt to get rid of snow and ice. Just garaging the equipment is really expensive- Princeton recently authorized preliminary expenses for a multi-million dollar cold storage facility to protect municipal works equipment. Those millions of dollars will be supplied by Princeton’s taxpayers. 2. How can we rehabilitate our street trees? Many of Princeton’s street trees are reaching the end of their lives and thousands are in imminent danger of being infected by an insect pest (the emerald ash borer) that is sweeping the country. 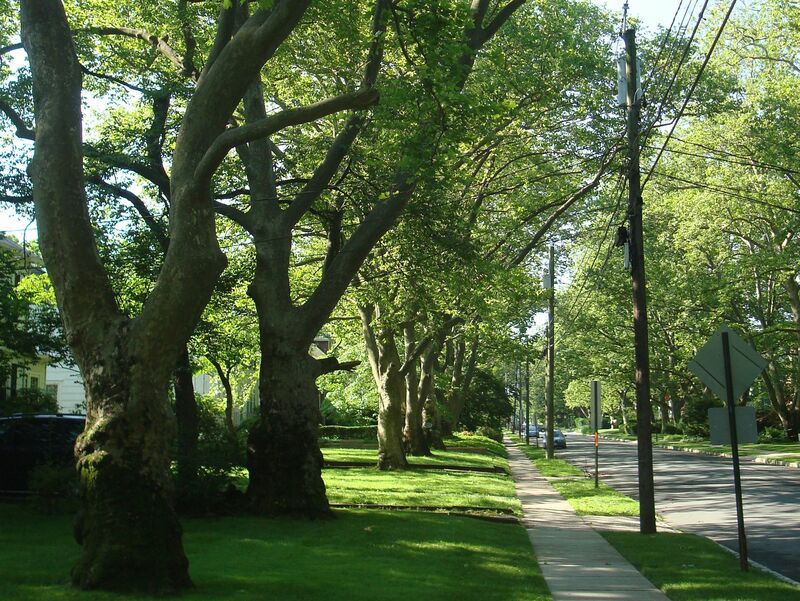 The cost of removing and replacing street trees in Princeton is certain to be upwards of a million dollars. Up to now, deferred maintenance has been the order of the day. But Princeton’s taxpayers will eventually have no choice but to hundreds of thousands of dollars for essential maintenance, because otherwise there will literally be trees toppling over in the street. It gets worse. Princeton’s firefighters are demanding more space for their operations, and Princeton is likely to face a bill for millions of dollars to expand the firehouse. Princeton’s aging sewer pipes? How long can we go without upgrading them? All these expenses are unavoidable costs of maintaining our aging suburban infrastructure. The problem seems grim, but there is a solution that could potentially avoid ever-increasing taxes. Adding more housing around our existing street network would require no additional garages for snow plowing equipment, no extra costs for replacing street trees, and no extra firehouses. But it would share the cost of these necessary expenses. One thing is sure: wishful thinking isn’t going to make the problems go away. Low-density housing can be sustained, but only by accepting a high tax burden. Zoning to allow more people to live in Princeton provides a way to share the cost of taking care of our aging town. Who do you think should pay for street trees and road maintenance? Have your say in the comments section below. This entry was posted in Density, Princeton, Smart Growth, Sustainability, Zoning and tagged Land use, Princeton, Zoning. Bookmark the permalink. Awww… Come on! Trees are an asset!! They increase property values and keep the town cool and shaded in summer lowering utility bills AND that make Princeton such a wonderful place to walk and bike. Yes they need to be maintained AND replaced but they add so much to the town. We’re on the same page there! the last thing we want to see is a bunch of trees dying and not being replaced properly. Empty tree-boxes are a sad sight.